Next week 'Anderson' is in reruns. To view our rundown of the first airing just click on the title. While Anderson is a huge fan of the AMC series "Walking Dead," he recently complained on Twitter, "Aargh. Now too much talk on #thewalkingdead. Blah, blah, blah. #morezombiesplease." ...@thehighestlevel on Twitter asked Anderson, "Mr Cooper did you happen to see the "walkingdead finale"? I heard it was EXCELLENT but I've yet to see it.#thewalkingdead"
Guests: *Miss Robbie Montgomery, Star of "Welcome to Sweetie Pie's"
*Tim (Miss Robbie's son), Manager of "Sweetie Pie's"
For additional clips and information on today's show, please visit andersoncooper.com by clicking on the hotlink below. Guests: *Bettina, Mom, started petition against "pink slime"
Most syndicated shows declined in the week ending March 18, thanks in large part to Daylight Savings Time, which drew viewers away from their set. In addition, the annual NCAA Men's Basketball Tournament tipped off and caused numerous preemptions for some strips, particularly those cleared on CBS affiliates. Among the closely-watched talk shows, Dr. Phil, which was bumped by basketball 41 times in the metered markets, and Dr. Oz tied for the lead at a 2.6. Dr. Phil maintained the advantage in total viewers, averaging 77,000 more per show than Oz. Dr. Phil fell 10% from the week before, but was still up 24% year-to-year. Dr. Oz declined 4% from the prior week. Live! With Kelly, Ellen and Maury all shed 4% to a 2.5, 2.3 and 2.3, respectively. Rachael Ray retreated 7% to a 1.4, while The Doctors slipped 13% to a 1.4. Jerry Springer softened 7% to a 1.4. Steve Wilkos fell the most, tumbling 14% to a 1.2. Wendy Williams and the already-canceled Nate Berkus were both unchanged at a 1.0 each. Anderson topped the first-run newcomers for the 27th straight week, holding steady at a 1.4, even though it was preempted 15 times in the metered markets. Jeremy Kyle and We the People were flat at 0.6 and 0.4, respectively. Please click on link for full article. Please click on link for list, which is for week ended March 18th. TOPIC: Bullying & The Documentary "Bully"
Guests: *Alex, Featured in the documentary, "Bully"
*Kelby, Featured in the documentary, "Bully"
AC360 viewers may remember, some of the other kids featured in the documentary "Bully" and Lee Hirsch participated in An Anderson Cooper Special Report - Bullying: It Stops Here, which aired on Sunday, October 9th. If you missed our post about the special, please click here. Race relations is one of the most explosive issues in America and for many it’s one of the most taboo to talk about, especially with children. 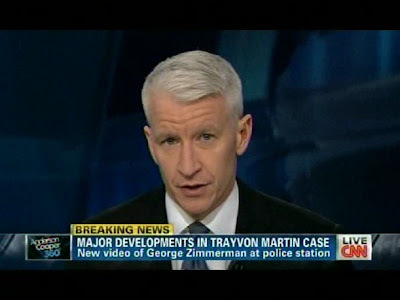 CNN’s Anderson Cooper 360° is exploring the topic of children and race in a week-long series and with special programming throughout the network and online. Children can be a mirror of society and their opinions can often tell how far we have come and still have to go when it comes to race relations in America. For this special report, Anderson Cooper 360° contracted a renowned child psychologist to help us understand how race influences a child’s world. 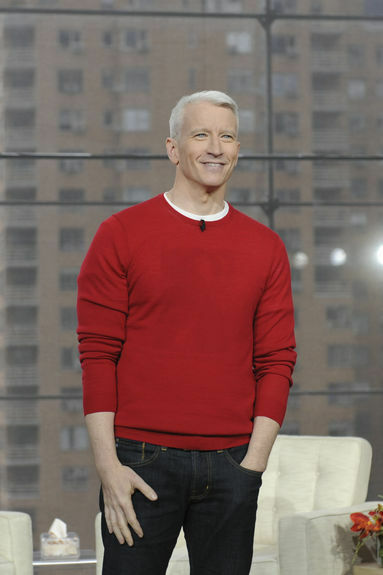 Anderson Cooper will talk with the children and their parents and their brutally honest, inspiring answers will become a wake up call that will spark a national conversation. The series titled "AC360 Special Report: Kids on Race, The Hidden Picture", will air the week of April 2nd at 8 and 10pm ET. The CNN commissioned pilot study builds on the original Doll Test’s historic research done in the 1940s that examined how African -American children interpret race, discrimination and stigma. 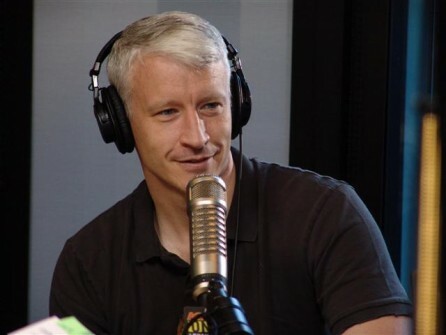 Teaming up with child psychologist Dr. Melanie Killen, the Anderson Cooper 360° ground breaking report scientifically explored how kids view interracial contact in their daily lives. The children, ages six and thirteen, were shown images that were scientifically designed to be ambiguous to children. “What is happening in this picture” was the starting point for interviews conducted with the group of 145 African-American and Caucasian children in six schools across three states. The report explored how children’s interpretations of the images often changed when the races of the characters were switched. This series will tackle controversial issues and answer some difficult questions. Is race a factor in how children view conflicts and choose friends? Do children see race or are they, as many parents believe, socially colorblind? How, when and why do they form their opinions on race? Can those opinions change over time or at a certain age, are kids “hard-wired” about race? And does the racial make-up of their school and environment affect their opinions on race? Cooper along with CNN anchor Soledad O’Brien will share with the viewers the children’s answers and the conclusions our researcher drew from their responses. They will also speak to the parents for their thoughts and reactions to conversations on interracial dating and bullying. CNN Digital will also cover the topic with video from the series, text pieces outlining the results of the CNN-commissioned pilot study and commentary on how kids learn about race. Interviews with Angela Corey (FL St. Attorney), Mikhail Muhammad (New Black Panther Party), Joe Oliver (anchor, reporter & Zimmerman friend) and Daryl Parks (Martin family attorney). We found Anderson's interview with Minister Mikhail Muhammad, whose organization The New Black Panther Party has offered a $23,000 reward for the capture of Zimmerman, worthy of including in our post tonight. Towards the end of the interview Muhammad said, " Your divisive tactics won't work today Anderson. You got to find another sucker, Anderson. Sorry to disappoint you, buddy." As AC said, in introducing the interview, "Decide for yourselves what he wants". Flashback Monday: Anderson Cooper & " Night At A Sleep Clinic"
Long time Anderson Cooper fans will know this isn't the first time Anderson has talked sleep. 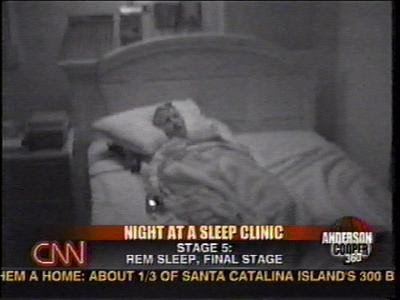 The following "Night At A Sleep Clinic" segment originally aired on AC360 on November 14, 2003. This is going to make sleeping easy. Well, most of us think of sleep as a time when our bodies shut down, but truth is a lot is going on in our brains and our muscles even while we slumber. Tonight, in our final installment of our weeklong series, "Sleepless in America," I foolishly offered myself up as a guinea pig for a night inside a sleep clinic. And as I found out, the first step is getting yourself all hooked up. All of us go through several stages of sleep, often in 90-minute cycles that repeat throughout the night. Stage one is the transition from being awake to asleep. It starts off when your eyes slowly begin to roll. REM sleep is the final stage of the sleep cycle. REM stands for rapid eye movement. It's the time of night we have the most vivid dreams. During REM sleep, your body's skeletal muscles shut down so you don't act out your dreams. But some people's muscles keep working. They suffer from REM Sleep Behavior Disorder, which means they can dangerously act out their dreams. Sleep clinics are used to observe many sleep disorders, like Restless Leg Syndrome and sleep walking. Thankfully, my sleep was not so exciting. Dr. Gary Zamet monitored my sleep cycles, which turns out are pretty normal. I deny I snore. That is just simply not true.